Tinga de pollo, black bean chipotle cream, queso fresco and pico. Served with corn slaw, avocado and white rice. This dish was mild and superb at the same time, with a nice presentation. The black bean chipotle cream sauce was mild but, flavorful. The texture was smooth and pleasing to the palate. The corn slaw was very good. I have never seen it served with avocado on top. The avocado was the perfect ripeness. 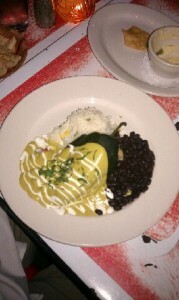 Corn, mushroom and jack stuffed poblano. Chipotle salsa and crema. 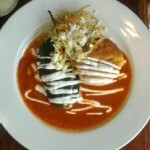 Served with corn pudding, corn slaw and queso fresco. The presentation was easily a 10. 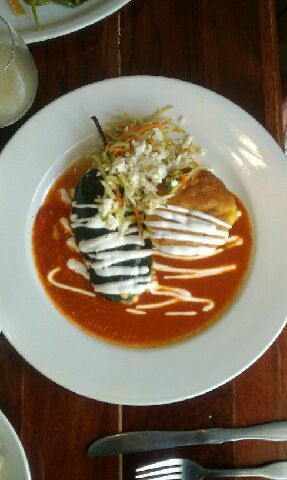 There were many big, succulent shrimp in this relleno – one in every bite! The Relleno sat in a chipotle salsa and crema bath. . Their chipotle is stellar, and I am not even a huge fan of chipotle because it is usually over-used! The corn pudding was a marvelous compliment and delicious too. The slaw was crunchy, not too sweet and served with queso fresco on it. We’d order this again and again. 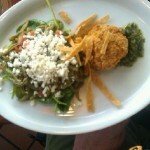 With jalapeño pecan pesto, nopalito salad, queso fresco and spinach. A crowd favorite, we really enjoyed this dish! 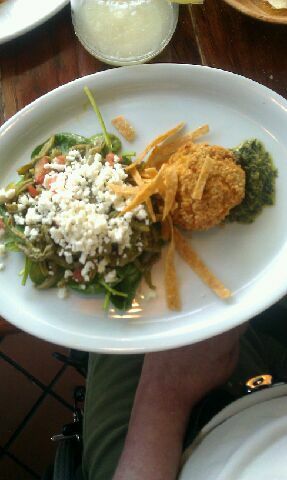 There was the right amount of crunchiness over the crab cake, and the jalapeno pecan pesto rocked. It was truly a fantastic pairing of flavors. And that Nopalito salad with spinach was muy delicioso. Corn masa filled with mushrooms and cheese. Served with salsa picosa and guacamole. This dish was really disappointing compared to all of the wonderful other dishes we shared. The masa lacked in flavor. Their Guacamole was made table side and was excellent. A few words must be said about the two salsas they serve at every table. The green salsa is like a tomatillo with lime. Way, too much lime. It is tart and was displeasing. The red smoked salsa was very good. And their chips have the right amount of thickness and crunch. We were there at approximately 1:00 pm and there were just a few other diners. We were greeted promptly and seated immediately. Our server enjoyed his job, he knew the menu very well and offered ideas and suggestions. He took our orders, checked back with us frequently and did a great job. The server had to go up and down the stairs many times to meet our needs when we drank and dined on the patio and never seemed to mind it. This is another uniquely Austin kind of place with a great menu. We dined inside for lunch during our first time there and then outside on the patio in early November. Both were just great. The location is great; right on Barton Springs. There are just a few front parking spaces and more in the back, up the hill. The place does not look like much from the outside, but the inside offers a unique Latin flare with indoor and patio dining. There is a full bar and a water fountain wall inside on the main level. Note: If you dine on the patio it is a trek to the bathrooms. It’s ok though because the view from the patio is worth it! Hi, I work for Urbanspoon, and came across you blog while doing research for the upcoming SXSW event. We would love to have links to your reviews on our site. If this is something that might be of interest, please feel free to contact me via my work email: meg@urbanspoon.com and I can provide you with more details.